University of California, Irvine scientists expect the world's fisheries to be, on average, 20 percent less productive in the year 2300, with those in the North Atlantic down nearly 60 percent and those in much of the western Pacific experiencing declines of more than 50 percent. "These conditions will cause changes in phytoplankton growth and ocean circulation around Antarctica, with the net effect of transferring nutrients from the upper ocean to the deep ocean," said lead author J. Keith Moore, UCI professor of Earth system science. 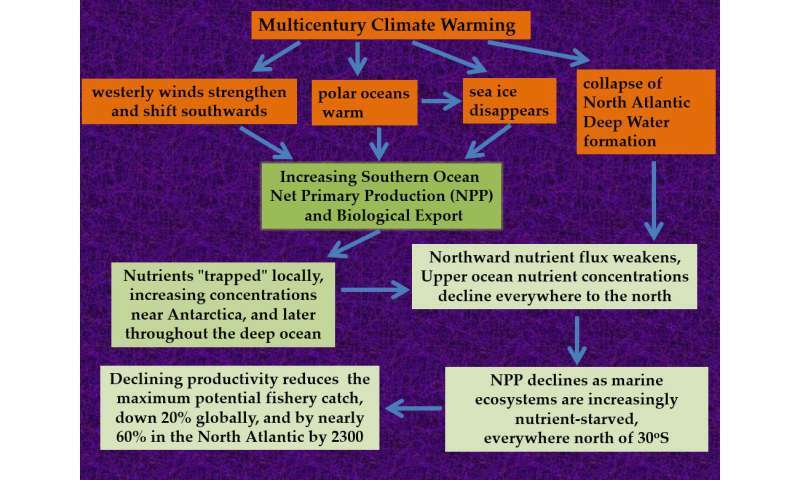 "Marine ecosystems everywhere to the north will be increasingly starved for nutrients, leading to less primary production (photosynthesis) by phytoplankton, which form the base of ocean food chains." 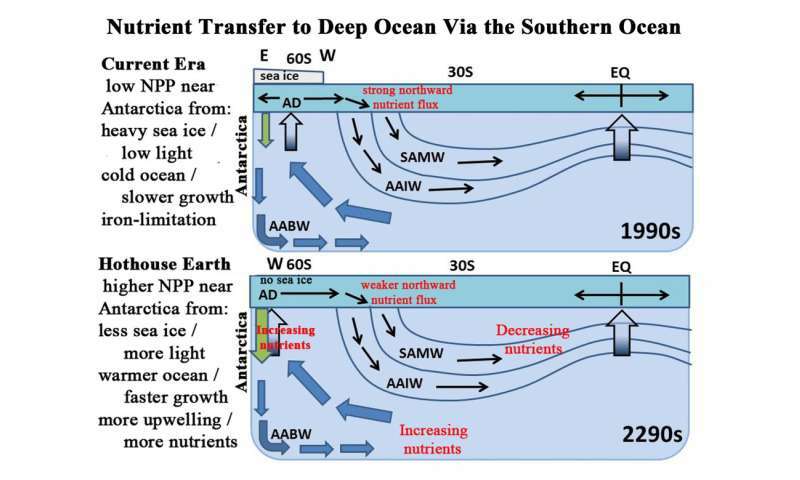 In today's ocean, nutrients are brought up to the surface around Antarctica but then move north and eventually flow into the low latitudes, supporting the plankton and fish populations there, Moore said. With increased phytoplankton growth around Antarctica, the northward transfer of nutrients will be greatly reduced. "You end up trapping the nutrients near Antarctica," he said. "Without the floating ice, which blocks much of the light today, you get increased photosynthesis," Moore said. "Combined with warmer ocean temperatures throughout the year, this leads to a longer growing season and faster plankton growth rates. Stronger winds drive increased upwelling, bringing nutrients to the surface, resulting in higher nutrient concentrations and more plankton growth near Antarctica." "By looking at the decline in fish food over time, we can estimate how much our total potential fisheries catch could be reduced," said Moore, who helped develop the Community Earth System Model employed in this study. He emphasized the importance of looking further into the future with climate models, something that isn't often done because of the computational resources such modeling requires. Months of computations using thousands of central processing units were needed to simulate the climate and oceans up to 2300. But stopping climate studies at the end of our current century, as is common among scientists and policymakers, is insufficient given the amount of time it takes for the ocean to absorb and respond to heat being trapped by the Earth's atmosphere today, Moore said. "The climate is warming rapidly now, but in the ocean, most of that added heat is still right at the surface. It takes centuries for that heat to work its way into the deeper ocean, changing the circulation and removing the sea ice, which is a big part of this process," he said. "This is what's going to happen if we don't put the brakes on global warming, and it's pretty catastrophic for the oceans," Moore stressed. "There is still time to avoid most of this warming and get to a stable climate by the end of this century, but in order to do that, we have to aggressively reduce our fossil fuel use and emissions of greenhouse gas pollutants." Good grief, no sign of joined-up thinking here. Do these scientists not take note of climate change modelling? 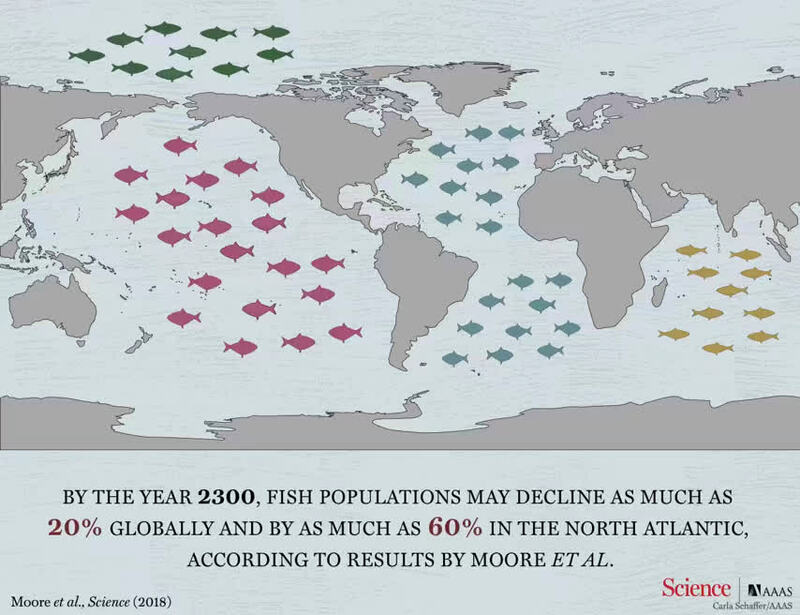 There's a strong chance there will be no one left to fish by 2300 or even much sooner. This is thinking in a bubble.